LOUISVILLE MAGAZINE 8.14 53 Special Advertising Section www.drodaniel.com Reputation that Precedes. . . Proud to be selected as a TOP SURGEON. 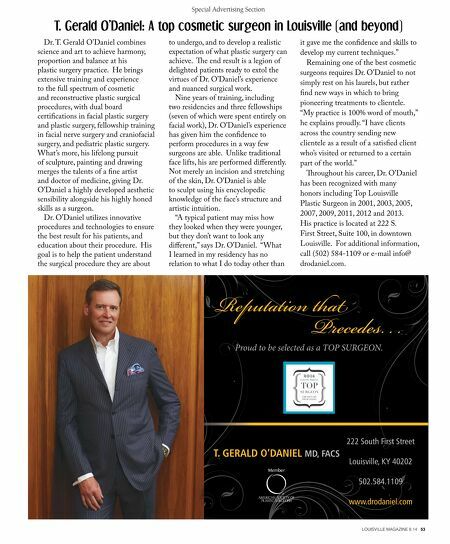 T. Gerald O'daniel Md, facs 222 South First Street Louisville, KY 40202 502.584.1109 www.drodaniel.com Dr. T. Gerald O'Daniel combines science and art to achieve harmony, proportion and balance at his plastic surgery practice. He brings extensive training and experience to the full spectrum of cosmetic and reconstructive plastic surgical procedures, with dual board certifcations in facial plastic surgery and plastic surgery, fellowship training in facial nerve surgery and craniofacial surgery, and pediatric plastic surgery. What's more, his lifelong pursuit of sculpture, painting and drawing merges the talents of a fne artist and doctor of medicine, giving Dr. O'Daniel a highly developed aesthetic sensibility alongside his highly honed skills as a surgeon. Dr. O'Daniel utilizes innovative procedures and technologies to ensure the best result for his patients, and education about their procedure. 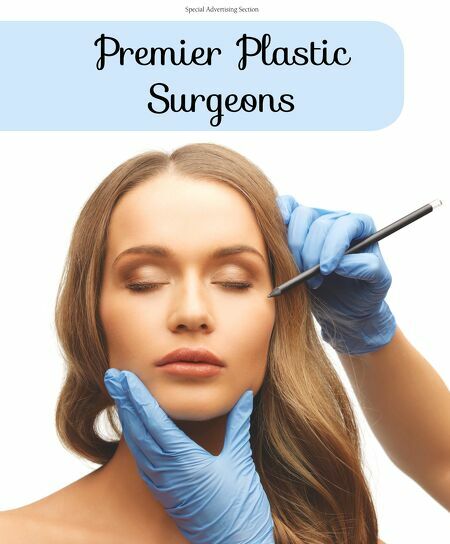 His goal is to help the patient understand the surgical procedure they are about T. Gerald OÕDaniel: A top cosmetic surgeon in Louisville (and beyond) to undergo, and to develop a realistic expectation of what plastic surgery can achieve. Te end result is a legion of delighted patients ready to extol the virtues of Dr. O'Daniel's experience and nuanced surgical work. Nine years of training, including two residencies and three fellowships (seven of which were spent entirely on facial work), Dr. O'Daniel's experience has given him the confdence to perform procedures in a way few surgeons are able. Unlike traditional face lifts, his are performed diferently. Not merely an incision and stretching of the skin, Dr. O'Daniel is able to sculpt using his encyclopedic knowledge of the face's structure and artistic intuition. "A typical patient may miss how they looked when they were younger, but they don't want to look any diferent," says Dr. O'Daniel. "What I learned in my residency has no relation to what I do today other than it gave me the confdence and skills to develop my current techniques." Remaining one of the best cosmetic surgeons requires Dr. O'Daniel to not simply rest on his laurels, but rather fnd new ways in which to bring pioneering treatments to clientele. "My practice is 100% word of mouth," he explains proudly. "I have clients across the country sending new clientele as a result of a satisfed client who's visited or returned to a certain part of the world." Troughout his career, Dr. O'Daniel has been recognized with many honors including Top Louisville Plastic Surgeon in 2001, 2003, 2005, 2007, 2009, 2011, 2012 and 2013. His practice is located at 222 S. First Street, Suite 100, in downtown Louisville. For additional information, call (502) 584-1109 or e-mail info@ drodaniel.com.